Ok so a poet I clearly am not. But I am kinda tickled pink with this recipe, and boxes of the decadent yet goodness-filled squares went out to three lovely bloggers. Amanda of Chewtown, Bryton of Food in Literature and Cassandra of Journey From Within each received a box of these gluten-free, low sugar, raw goodies. In turn, I welcomed sugary goodness in the form of Butterscotch Pecans from Fiona of Tiffin and Raw Date and Almond Truffles from Karla of Get On Up. In its second year, the Sweet Swap, organised by Amanda (Chewtown) and Sara (Belly Rumbles) is a fun, innovative event that brings Aussie bloggers together and benefits a worthy cause. See the note below first regarding coconut cream. Prepare a tray lined with grease-proof paper. To make the base, place all the ingredients in a bowl and stir. It will probably be a little too thick to stir, at which point you can knead with clean hands. If the nut butter you use is on the runny side, you may need to add a little more milk or protein powder to achieve a bread dough consistency. Press the mixture down into the tray to roughly a 6-8mm thickness. To make the topping, melt the chocolate in a double boiler or in 20-30 second bursts in the microwave. When it is fully melted, quickly stir through the coconut milk before the chocolate seizes up. Quickly spread the mixture evenly over the base and sprinkle with cacao nibs or coconut. Place in the refrigerator for at least 2 hours before slicing with a sharp knife. Use coconut cream with no additives (I use Ayam brand), and pop the can in the refrigerator for at least 6 hours or overnight. Then, open the tin without shaking and use the thick part of the cream off the top of the tin. a lovely sweet post! i could do with a slice ( or 2)! Thank you and feel free to come on over for a slice! Lovely poem!! 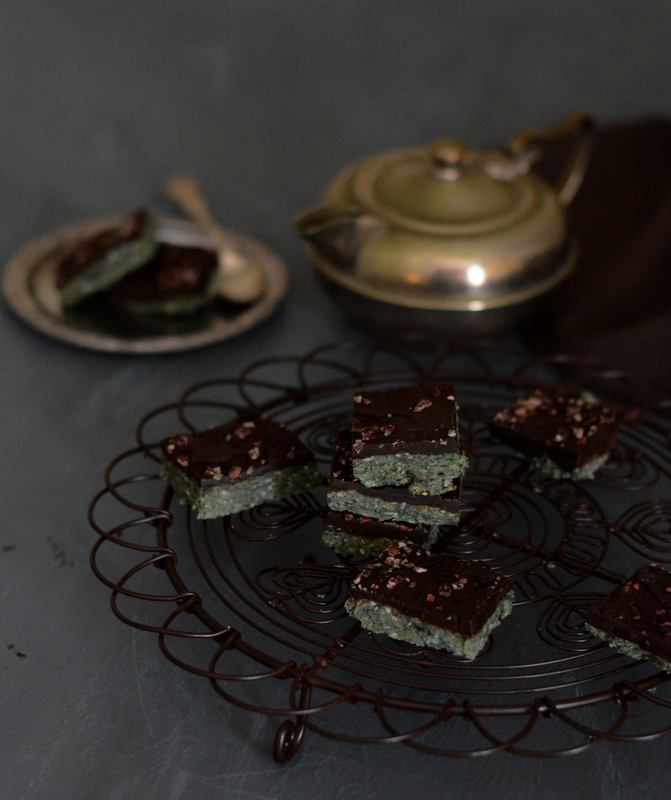 I love mint slices, but never had one that had macadamia nuts and coconut in! Haha. …Thank you! The poetry leaves much to be desired but I promise the slices are (were) good! ! I just recently had a slice of raw buckthorn cake at Johan och Nyström in Helsinki and it was delicious! 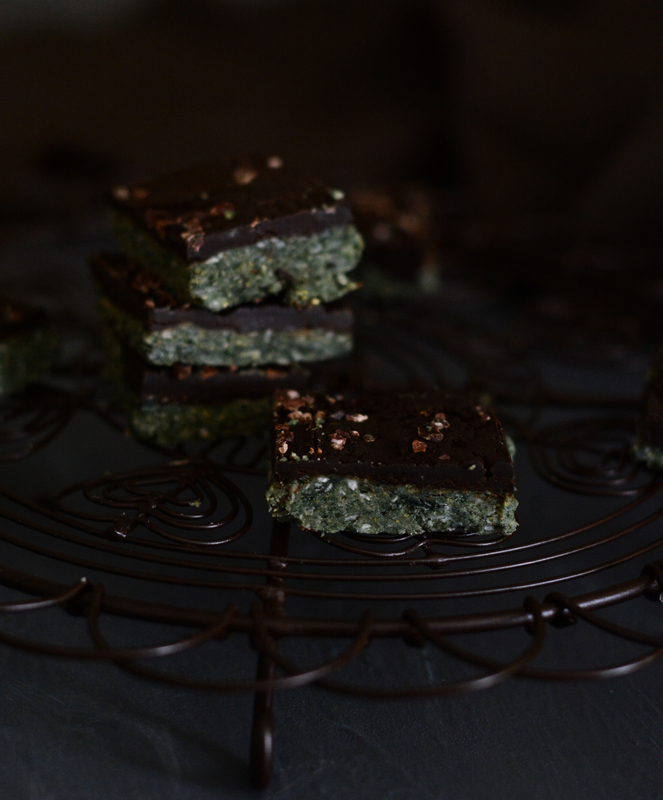 I would love to try out your mint slices…they look delicious! 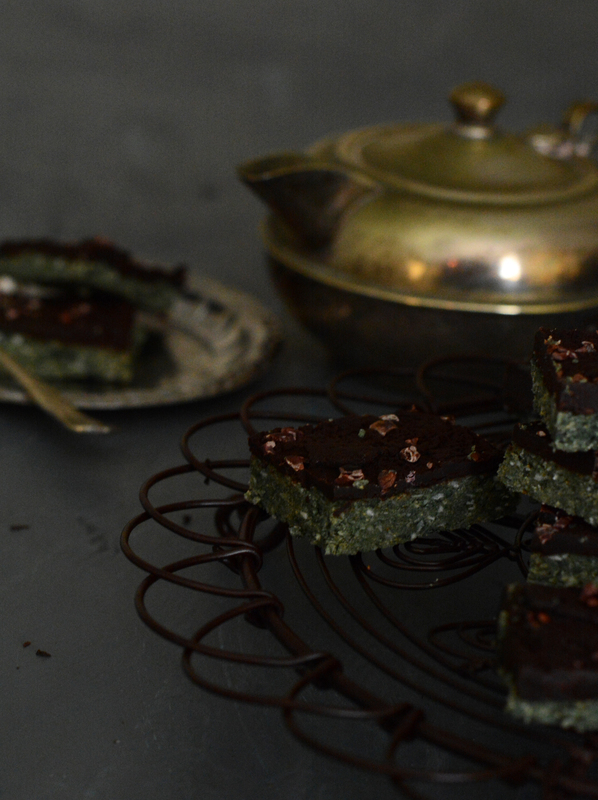 I love the combination of mint and dark chocolate….ummmmm sinful.